Download or Stream instantly more than 55,000 audiobooks. 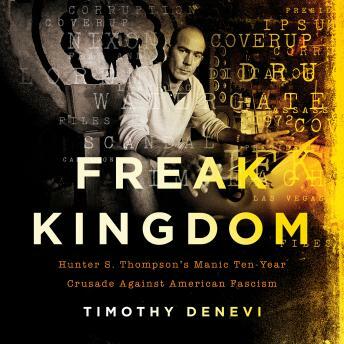 Listen to "Freak Kingdom: Hunter S. Thompson's Manic Ten-Year Crusade Against American Fascism" on your iOS and Android device. Don't have an iOS or Android device, then listen in your browse on any PC or Mac computer. Hunter S. Thompson is often misremembered as a wise-cracking, drug-addled cartoon character. This book reclaims him for what he truly was: a fearless opponent of corruption and fascism, one who sacrificed his future well-being to fight against it, rewriting the rules of journalism and political satire in the process. This skillfully told and dramatic story shows how Thompson saw through Richard Nixon's treacherous populism and embarked on a life-defining campaign to stop it. In his fevered effort to expose institutional injustice, Thompson pushed himself far beyond his natural limits, sustained by drugs, mania, and little else. For ten years, he cast aside his old ambitions, troubled his family, and likely hastened his own decline, along the way producing some of the best political writing in our history. This timely biography recalls a period of anger and derangement in American politics, and one writer with the guts to tell the truth.